Another Winter Storm Slams The Northeast : The Two-Way The system was bringing hurricane-force winds and near-white-out conditions to parts of the region, with northern Massachusetts and the Boston area particularly hard hit. 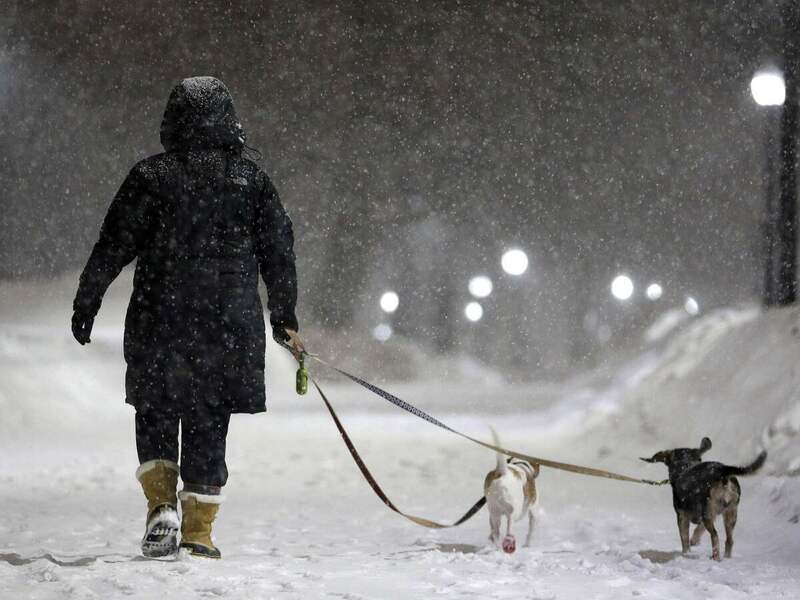 A woman walks with two dogs as snow falls on Boston Common in Boston, on Saturday. The fourth winter storm in the Northeast this year was adding to the 6 feet of snow already on the ground in some areas, bringing with it hurricane-force winds and near-white-out conditions. In Massachusetts, Gov. Charlie Baker said at a news conference early today that snowfalls had already "significantly exceeded" expectations. Accumulation in the northern half of the state exceeded a foot in some places. According to The Boston Globe, Baker "urged residents to stay off the roadways through early Sunday afternoon, when the worst part of the storm was expected to pass." Baker said the storm was "officially a blizzard," the Globe said, but National Weather Service meteorologist Alan Dunham said the weather service likely would wait until the end of the storm to declare the storm a blizzard, according to the newspaper. "Before it is all over, southern New England could get several more inches and Maine could see up to 2 feet, weather forecasters said. "Transportation officials in the region had taken precautions. Nearly 400 Sunday flights were canceled at Boston's Logan International Airport, and none was scheduled Sunday morning. The Massachusetts Bay Transportation Authority canceled all rail, bus and ferry service in the Boston area on Sunday."